Pure Luck Tours California Dairies! 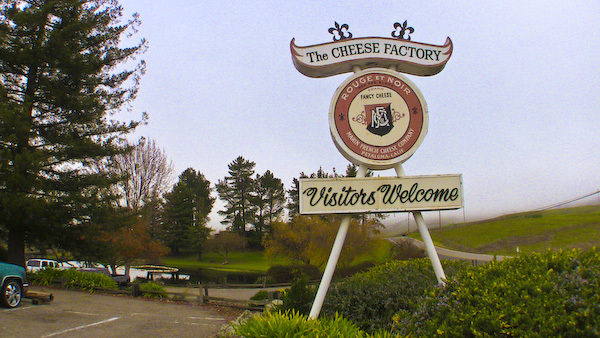 After Thanksgiving, Amelia, Gitana, and I (with all the kids in tow) went to visit some of the wonderful dairies and cheese makers in California. First stop… Harley Farms in Pescadero, CA. We arrived at Harley Farms and enjoyed a tour that took us out to the pasture with the goats, through the milking parlor, across the garden, into the cheese plant, and up to the tasting room. The place was beautiful! I think my favorite part was the enormous handmade wooden table and chairs in the tasting room. Thank you Dee, it was a pleasure! Later that night in San Francisco, I got to visit one of my favorite people of the cheese world. Gordon Edgar is the cheese buyer for Rainbow Grocery, a worker owned co-op. He has a great cheese department over there and really knows his stuff. You can follow his blog at www.gordonzola.net. Also, keep an eye out for his book Cheesemonger: A Life on the Wedge. Great to see you, Gordon! After San Francisco, we went out to Sonoma. There we saw one of my other favorite cheeseheads, Sheana Davis of The Epicurean Connection and creator of the cheese Delice de la Vallee. It was awesome to see Sheana’s new storefront where she features cheeses, sweets, maple syrup, and I hear she cooks up some wicked waffles too! We are thrilled to have someone like Sheana as a friend. The next place we visited was Redwood Hill Farm in Sonoma County, CA. Amelia got a great tour of the cheeseplant facility, and then we all got to go to the farm where their herd is kept. We really like how these guys raise their goats, they have some of the best Alpines I have ever seen. There is a reason this is the place we get our bucks from. Thanks, Jennifer and Scot, it was a real joy to see where our main man Fabuloso came from. For a little diversity from the cheeses, Amelia and I hit up a brewery in Santa Rosa later that night. We went to Russian River Brewing Company and enjoyed some of their tasty offerings. Everybody needs a little Salvation from time to time. Next, we stopped into Marin French Cheese Company and watched them make some lovely cheeses. I was amazed that even though they were producing a very large amount of cheese, everything was still all done by hand. Right down to the wrapping and labeling. It was a sight to see! Last but not least, Amelia went up to Point Reyes Station and visited Cowgirl Creamery She said it was fabulous watching them make their Red Hawk cheese! Thanks for having us California…now we have to get back to work! « Fall Workshops Over, A Complete Success! so much cheese in such a short amount of time! Glad I got to see you.